THE AFTERNOON SUN GLARES through my windshield as the traffic on 280 contracts to a slow crawl at Page Mill. I look for openings in the automotive flow. The right lane sails ahead of the crawling masses as far as the overpass. Then the far left lane begins to move. Other people with vastly better pickup than my 10-year-old Toyota slip into openings ahead of me and roll slowly past. Inevitably I am left festering in the slanting sunlight behind a steaming tar truck, watching car after car leave me behind. That, says Dr. Driving, is the fundamental conflict at the root of America's automotive dysfunction. "In driving, you are put in an inherent conflict," the good doctor explains. "There is an inherent conflict between the freedom that cars represent--being able to go wherever you want, whenever you want--and being thwarted by other cars that stand in the way." Frustration builds to anger, anger to violent fantasies, fantasies to bad driving, and from there the pavement really gets ugly. It's a well-worn formula by now. But Dr. Driving , a.k.a. Leon James, a psychology professor at the University of Hawaii, is hoping to throw a little sense into the road-rage mix. Since coming to terms with his own terrible driving, James has helped to create a whole new area of psychology. 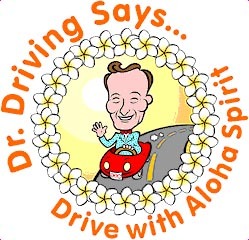 He teaches a class on traffic psychology at the University of Hawaii, he runs his own website, www.drdriving.org, where he posts the extensive results of his research, and he's coming out with a book on road rage next fall. For decades, James readily admits, he drove like a jerk. He hurtled around corners, sped up to stop signs, changed lanes and then looked to see if someone was in the way. He sent his dear wife's mother lurching for the door handle around every curve. One day, in 1985, when his wife complained about her poor mother rolling around in the back seat, James told her off. It was like hitting rock bottom. He realized he had a problem. James began to examine his own driving and finally came to realize that his wife and mother-in-law had a point--he was indeed a terrible driver. The gap between his understanding of himself and the very obvious problems with his driving technique led him to believe that there was plenty of room here to apply his psychological training. During a decade of research, James has found that people who say they are great drivers also tend to be the most aggressive. That in general men are more aggressive drivers that women, but that women curse more than men. Dreaded SUV drivers really are a menace, and motorists in Pennsylvania are more aggressive than Californians. He's broken down the world of driving dysfunction into neat psychological categories that he says people fall in and out of depending on their mood or circumstance. Someone could easily go from being what he terms a supportive driver, following the speed limit and allowing others to merge onto the freeway, to an automotive vigilante--someone who cuts off other drivers or gestures or tailgates in retribution for some perceived slight. There is the rushing maniac, whose panic is only pacified by tailgating and compulsive lane changing, and every rushing maniac's best friend, the left-lane bandit, who drives 67 miles an hour in the fast lane because he or she knows best. But what is most important is that James says he's found a cure for our intricate automotive dysfunction. The key is self-awareness. James has his students talk into a tape recorder as they drive, detailing their thoughts and feelings as they drive. That helps them to deconstruct and examine their own behavior. He calls it a driving log. Once the driver is willing to acknowledge that there may be problems, the driving log helps him to determine what they may be. And then, he says, students learn to modify behavior by focusing on one problem at a time. Like the owner of the Hair Club for Men, James is his own best customer. Since 1985, his own driving has gone from abominable to safe and courteous 80 percent of the time, he says. In another 15 years, he says, he'll be a good driver 100 percent of the time. And best of all, James says, his relationship with his wife couldn't be better. From the October 7-13, 1999 issue of Metro, Silicon Valley's Weekly Newspaper.